Make trays, plaques, planters, jewelry, and decorative pieces by embossing, tooling, repoussé, or overlay. 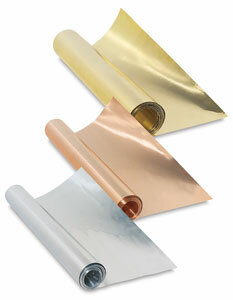 This tooling foil cuts easily with household scissors or metal snips. The copper can be antiqued to a slate, gray finish with liver of sulphur.